This month’s COG (for which I am late…the dog ate my homework, Teacher Jasia!) asked us to Research From Scratch by starting a search on someone else’s family tree. When I began my own family research about 21 years ago, there were not any records available on the internet. Lately I’ve wondered how much I could have found if I had waited until today to begin my search and how much easier it would have been. This challenge was an opportunity to find out. The subject of my experiment: actor-singer-dancer-director Gene Kelly. As most visitors to this site have since surmised, Gene Kelly is what I call my “other gene hobby.” Gene was well known for his smiling “Irish eyes”, but I was curious about his Canadian and German ancestry as well. Starting from scratch, how much could I find in a few hours? In that short amount of time, I learned a lot about his ancestry. But I also learned some research lessons that I’d like to share. Start by interviewing your family, but don’t believe everything they say as fact. When I began my own research, I started by asking my parents questions about their parents and grandparents, and I also referred to an interview with my grandmother when I was in grade school and needed to complete a family history project. That same advice holds true today – you need basic facts about a family to begin your research. In the case of my subject, I couldn’t actually talk to Mr. Kelly. So instead I turned to the only biography that was written during his lifetime in which the author interviewed Kelly himself. The book is Gene Kelly by Clive Hirschhorn (Chicago : H. Regnery, 1975). While it is not entirely accurate – especially since it begins with the incorrect birth date of its subject – it was a way to get basic information about his brothers and sisters, parents, and grandparents – as close as I can get to acquring the info from Gene himself. Gene’s parents were James Patrick Joseph Kelly and Harriet Curran. They married in 1906. Both came from large families; James was one of eleven children, and Harriet one of 13. Harriet’s father, Billy Curran, “had emigrated to New York from Londonderry in 1845…via Dunfermline in Scotland.” Billy met “Miss Eckhart”, of German descent, married and moved to Houtzdale, PA. They later moved to Pittsburgh. Billy died before 1907 from pneumonia after he was left in the cold at night after being robbed. There were 9 Curran children, and 4 who died, but only 7 are named: Frank, Edward, Harry, John, Lillian, Harriet, and Gus. In addition to Gene’s parents’ info were the basics about their children. In birth order, the Kelly family included Harriet, James, Eugene Curran, Louise, and Frederic. Gene was born on August 23, 1912. This is plenty of information to begin a search. But, don’t believe everything you read or everything your family members tell you – sometimes the “facts” can be wrong, and only research will find the truth! Census records are a great place to begin your research. Names can be misspelled. I expected this with Zawodny and Piontkowski, but not with Curran! The Curran family is listed as “Curn” on the 1900 census. Ages are not necessarily correct. It seems that Harriet Curran Kelly has a similar condition to many of my female ancestors – she ages less than ten years every decade and grows younger! Information can differ from census to census, and these conflicts can only be resolved by using other record resources. Despite birth year variations for both Gene’s mother and father, James Kelly’s immigration year differed on each census as did Harriet’s father’s birthplace (Pennsylvania, Ireland, or Scotland?). Finding in-laws is a bonus, and a great way to discover maiden names. If I didn’t already know that Harriet’s maiden name was Curran (from Gene’s biography – and it is also Gene’s middle name), I would have discovered it on the 1930 census since her brother Frank Curran was living with the Kelly family. Also, I knew Harriet’s mother’s maiden name was “Eckhart” from the biography, and the 1880 census of the Curran family lists her brother and sisters – James, Jennie, and Josephine Eckerd. In the few hours of research on census records alone, I was able to trace Gene’s father only to 1910 after his marriage to Harriet. In 1900 he was single, and I was unable to find a recent Canadian immigrant named James Kelly. Gene’s maternal line ran dry with the Curran’s in 1880. William Curran and Mary Elizabeth “Eckhart” married after 1870. There are too many William Curran’s from Ireland to determine the correct one, and I was unable to locate the Eckhart family prior to 1880. Naturalization records provide the best information – after 1906. The signature of Gene Kelly’s father from his “declaration of intention” petition in 1913. Ancestry.com also provided James Kelly’s naturalization record. In addition to confirming his birth in Peterborough, Ontario, Canada in 1875 (also found in Ancestry’s World War 1 Draft records), the petition lists his immigration information and the birthdates of the first 4 Kelly children (youngest son Fred was not born at the time of his father’s naturalization). Unfortunately the record does not list the birthplace of Harriet other than as Pennsylvania. Was it in Houtzdale, PA, where her parents resided in 1880 or elsewhere? Although Ancestry has Canadian census records, I was unable to definitely find James Kelly in Ontario on the 1881 or 1891 census. The internet helps you find a lot of information, but not everything is online. Census records can only get you so far before you need vital records. While many states also have these records online, Gene Kelly’s ancestors settled in the same state as mine, Pennsylvania, which is not one of the “friendlier” states when it comes to accessing vital records. If I were to continue with the Kelly research, vital records would have to be obtained offline. It would be useful to obtain the marriage record for William Curran and Mary Elizabeth Eckhart, which may have occurred in Clearfield County since that was their residence in 1880. Finding this record would reveal both sets of parents’ names and possibly birth information for William and Mary Elizabeth. For the Kelly side of the family, I would likely attempt to obtain James Kelly’s birth record in Peterborough. I was able to confirm many of the intial facts I started with, but I didn’t learn any essential information in addition to those facts. Specifically, I hoped to learn more about Gene’s maternal grandmother’s German roots, but I was unable to find out anything more about the Eckhart – Eckerd family using Ancestry.com alone. More offline research is learn more about this branch of the family. I did learn more about Gene’s aunts and uncles – this is important because researching collateral lines can lead to important information about shared direct ancestors. Finally, I learned that it is much easier to start from scratch now than it was 21 years ago. Even though the record sources I used were the same, digitization and the internet has made it much faster to find information! And easier, which is great because it will hopefully prompt more people to start from scratch! What are you waiting for? Start researching your family! This entry was posted in Carnival of Genealogy, Census Records, Research Tips and tagged Gene Kelly by Donna Pointkouski. Bookmark the permalink. “The internet helps you find a lot of information, but not everything is online.” I hear you, I so hear you! Boy, I wish I’d thought of this! Great job, Donna! If only Gene had been left in your capable hands. Ah! This was a great idea! I read a biography on Mae West a while back and the author mentioned using census records for research. At the time I though what a cool idea, to research someone famous. Gene Kelly has always been one of my favorites. My great aunt lives in Houtzdale, Pa and recalled the Kelly family living there. She told me stories of how Gene Kelly would come back to town and teach dance to the locals. My great aunt is almost 90 and was born and raised in Houtzdale. p.s. She pointed out to my sister and I the Kelly family home when we visited Houtzdale two years ago. What fun to read! There was always a family story that our Currans of Moira and/or Malone New York were somehow connected to my childhood idol, Gene Kelly. Oddly, I have been looking most recently at the “Curn” family, as it may fit into my puzzle. There were Currans in Canada that popped down to NY, and the census records from 1850 and 1860 show both Curn and Kerns families that may well be Currans. Did you ever go any further with your search? If you have, I would love to know more! Around 1956 I had an English teacher at Homestead Jr. High, Homestead, Pa. (very near Pittsburgh) who claimed that she was Gene’s sister. At the time I wasn’t sure I believed her, but now I realize that it was quite possible. Does anyone recall her? Her last name wasn’t Kelly (probably because she was married) but of course I can’t remember what it was, though I believe it was a Polish name. (ending in “ski”). According to her she had been a dancer but injured her back and was stuck teaching English to us. She did kind of look like him, being of small stature and with dark brown hair. @Carol S., that would have been Gene’s eldest sister, Harriet. my brother married one of the twin daughters (Barbara) of Gene’s brother “i think Jim/James” they lived in Woodland Hills, CA in the 1960s. Barbara had a daughter, Kimberely Ann, who is my niece, Gene’s grand-niece. Can anyone confirm the father of the twin girl;s name, thanks. I read somewhere that Gene’s grandmother was French (from Alsace, a region of France near Germany which was annexed by the German Empire after the 1870 war but reannexed by France after WW1). In Alsace, many people have names which sound like German names. This could explain his love for France. This is so wonderful. 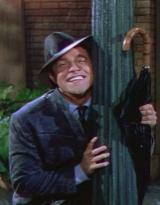 I cannot get enough of hearing about Gene Kelly. As true a person as God ever made and an asset to this country and the planet. Are any of Gene’s family still living in Pittburgh? My family is from there. Our clan the Magee’s came over in the late 1700’s. I love knowing that Gene was from there; a fact I have learned quite recently. God Bless Gene Kelly – his wonderful legacy and his TRUE FAMILY – KERRY, TIMOTHY, BRIDGET, and their descendants. A pox on the evil Patricia Ward who does not deserve the name Kelly. Curran’s also came out of Barna near Galway, Ireland.